Not every job search is created equal. For many professions, a job search can be as comprehensive as visiting a job board (or five) and submitting your resume to the postings that match your qualifications. For new physicians, or those who have not been in the job market for a while, finding the right position is a whole different animal. That is where a physician recruiter comes in. In fact, the New England Journal of Medicine reports that almost 90% of Physicians find their most useful leads through personal or professional referrals. Yet, “working” your network to discover a great opportunity can be a challenge when you are balancing so many demands for your time and attention. That’s why many physicians have discovered the benefits of using a professional recruiting firm to find the practice opportunity that is a great fit for themselves, their spouses, and their families. Why Use a Physician Recruiter? Resources and Networks – The old adage “it’s not what you know, it’s who you know” still applies in the modern job search world, and good recruiters know a LOT of people. An experienced recruitment firm will have relationships with healthcare organizations all over the country. Recruiters are on the front line in addressing the physician shortage challenge. They are a great source of information regarding hiring trends, physician compensation, and facility-specific insight in nearly every specialty and region. 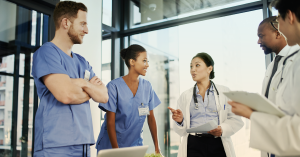 Access – Hospitals, medical groups, academic medical centers, and community health centers rely on the breadth of a recruiter’s network to tap into the best pool of physician candidates. In turn, a recruiter may have access to opportunities that aren’t publicly posted or advertised yet. A recruiter can share facility-specific information that matters, such as organizational culture, turnover rates, and the quality of the leadership team. Their familiarity with the community will provide valuable background to determine if an opportunity is right for you and your family. Negotiating Partner – A physician recruiter offers the advantage of being your trusted partner as you prepare for an interview and navigate the contract process. Hospitals and groups want to fill their positions with highly-qualified candidates. Physicians want to be compensated fairly while being confident that they made the right decision. The recruiter wants those things for all involved. Recruiters can establish realistic expectations and help you negotiate an offer that is consistent with what you need and deserve. How to Get the Most Out of Your Relationship with Your Physician Recruiter. The recruiter is there to facilitate your candidacy so building a strong relationship will maximize the benefits of working with them. Know what you want – Don’t expect your recruiter to automatically know everything that is going to make you happy. 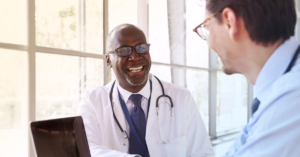 They can always be a sounding board for questions about certain locations or facilities, but it is up to you, the physician, to do some self-discovery to provide them with information. Take time with your significant other to determine where you might want to live, what things are most important to you, etc. The more you share with your recruiter, the better your chances of finding a great job. Stay in Touch – Work on making time for your search. Don’t ignore your recruiter’s phone calls or emails. Timely responses are essential to keep the ball rolling, and responsiveness also demonstrates that you are serious about the search! Ask Questions – No need to be apprehensive in asking questions of your recruiter. Have them explain how they are being compensated for their efforts. Never pay your recruiter: quality recruiters are compensated by the hospital or group that has contracted with them to help fill the opening. Be Upfront – Be sure to let them know about how many other recruitment firms you are working with and if you have other upcoming interviews. Knowing where their client stands among your choices maintains the strong foundation of transparency in the relationship. A strong relationship with your recruiting partner can make all the difference in the world by relieving much of the stress and headache of the job search. Putting your search in the hands of a knowledgeable recruiter will afford you the time to continue focusing on your priorities, while your recruiter does the heavy lifting to ensure you find (and secure) the best fitting job for you. Visit our physician candidate page for more information about how the process works or browse our current positions on our job search page.